look of the interior of any motor vehicle car. Leather that looks old and grubby will negatively affect the re-sale value of your vehicle. Whilst, well maintained leather upholstery is a significant plus. guard, is effective against super-bugs and contains a UV inhibitor to help prevent fading. Which is very welcome for soft tops. 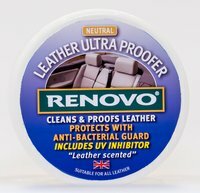 Renovo Leather Ultraproofer is very simple to apply. "Hello, I'd just like to say I'm very pleased with the service I have received from you. I spoke to a representative and he was nice, knowledgeable and very helpful. This is the second time I've ordered Zymol products from you and the orders have always been spot on. (something sadly you cant always depend on these days in other experiences of phone/internet ordering) It arrived well packaged and when you said it would be delivered and the service is consistent too which I value. So often I find that when I need to contact a company a second time you never speak to the same person, as they've changed their website, logo and even their name which is very confusing! Vertar give consistent, helpful, knowledgeable, efficient no-nonsense service. It’s a pleasure being a customer of yours, thank you "